Bordeaux – The upturn in the value of world wine consumption is set for a record global market value of $224.5 billion by 2021, forecasts Vinexpo/IWSR in its annual forecasts for the wine and spirits sectors. A comparison of the ten years from 2011 to 2021 shows that the value of the world wine market will grow 40% to reach volume sales of 2.66 billion 9-litre cases. Driving the recovery are the USA and China, the world’s two most powerful economies, whose joint growth in wine consumption offsets declines elsewhere, notably in Europe. Over the next five years, China will become the world’s second largest market for grape wine behind world leader, the USA. Chinese consumption is expected to rise by over one third to $23 billion over the next five years when it will reach volume of 192 million cases. By comparison, in 2016 a volume leap of 8 million cases pushed the value of the Chinese wine market to $15.24 billion (growth driven almost exclusively by still wine). The USA, the world’s most valuable wine market worth more than $36 billion in 2017, is poised to grow over 25% in the run up to 2021, reaching more than $45 billion. A number of other factors for growth range from a global love of sparkling wine, a clear global trend towards premium brands, and strong sales of whiskey. Sparkling wine is forecast to grow by an average 2% year-on-year to 2021, driven predominantly by North America, but also showing strong growth in the UK and Asia-Pacific countries such as Australia, Japan. Those two countries helped to push sparkling wine in Asia-Pacific to a total value of $2.79 billion in 2016 for 9 million cases. By 2012 that figure is forecast to rise to $3.73 billion (15.8 million cases). Prosecco will outstrip other major categories such as Champagne and Cava by 2021 when world Prosecco consumption is set to reach 40 million cases. In the UK, the world’s largest sparkling wine importer, Prosecco is an outstanding success. Nonetheless, the USA is expected to show the most growth in consumption of Prosecco by 2021, while remaining number two behind the UK. Champagne’s shift in focus from Europe to emerging markets looks set to accelerate. Europe’s share of global Champagne volume is forecast to have decreased by 4 percentage-points by 2021, from 80% recorded in 2016. In keeping with the trend to “drink less but better” premium wines are forecast to drive global still wine consumption. The premium segment – wines selling for between $10 and $20 – is forecast to grow by over 60 million cases during this period. Standard brands ($5-$9.99) will grow just short of 32m cases, and super-premium-plus just short of 5 million cases. The biggest losses will fall below $5, where the global category is expected to lose 75 million cases. In spirits, too, premium price points are generally performing better than value, with mainstream standard brands developing at a healthy rate. Whisky is expected to perform particularly well, especially Scotch and US whiskey, and to a lesser degree gin and tequila. This development broadly reflects the premiumisation trend with premium-and-above segments growing the fastest. The US and China will drive global growth of premium-and-above spirits. Combined, they are expected to add 30 million cases in these price segments, compared to a net gain of 46 million cases globally. Meanwhile, the power of the Asia-Pacific region and the role of Hong Kong as a major business hub is highlighted by projected regional growth over the next five years from $29 billion in 2016 to $40.8 billion by 2021. Guillaume Deglise, CEO of Vinexpo commented, “Since Vinexpo began tracking world data so many years ago we have witnessed the remarkable rise of the Asia Pacific region and its massive contribution to growth of the wine and spirits sectors. Being in Hong Kong since 1998 is a winning strategic choice that Vinexpo offers to its clients”. The 20th anniversary of Vinexpo Hong Kong exhibition will take place from May 29 to 31, where 1300 exhibitors from 28 countries will showcase their products to an expected 18000 visitors. Vinexpo organises wine and spirits events for industry professionals acting as the sector’s international partner since its establishment, in 1981, on the initiative of Bordeaux Gironde’s Chamber of Commerce and Industry. Through its 35 years B2B experience the Group has developed an in-depth understanding of the market, as well as establishing strong relationships with key distributors across the world. It runs exhibitions in five set locations (Bordeaux, Hong Kong, Tokyo, New York and soon Paris), and one touring show (Vinexpo Explorer). Vinexpo thus covers the three continents with the highest consumption rates, and continues to be the market leader for wine and spirits events as the go-to forum for producers and buyers. The Group is expanding with two new exhibitions in New York (2018) and Paris (2020) and with Vinexpo Explorer (held in Austria in 2017) scheduled to take place in California in September 2018. 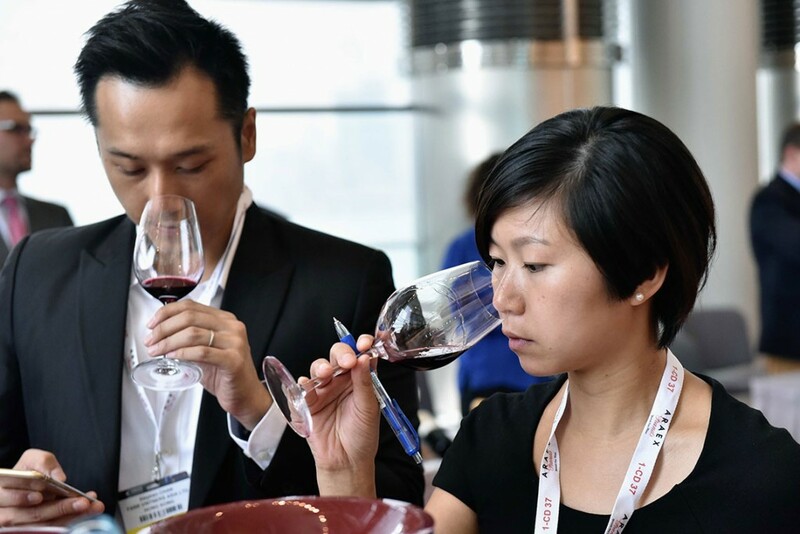 Vinexpo’s successful expansion strategy is marked this year by the 20th anniversary celebration of its pioneering establishment in Hong Kong, in 1998, of the first ever wine and spirits exhibition in the region. The California Directory of Fine Wineries proved an ideal visual resource showcasing the best of California’s celebrated tasting rooms and iconic wine brands. HAVANA, CUBA—When a jaunty contingent of California winemakers gathered in Havana last week to make history at Cuba’s first trade show of American wine, the Yankees brought with them gift copies of The California Directory of Fine Wineries to leave with their congenial Cuban hosts. The California Wine Symposium brought together the California Wine Institute with the Napa Valley Vintners and Sonoma Valley Vintners & Growers associations in an effort to foster connections between winemakers and the Cuban hospitality industry. Coordinated by U.S. Cava Exports founder and CEO Darius Anderson, who’s been working for the past two years to assist California growers in negotiating contracts to export California agricultural products to Cuba, the symposium reflects the recent diplomatic thaw between the USA and Cuba that has brought increased tourism and North American interest in commerce with the island nation. The California Directory of Fine Wineries, now in its 7th edition for Napa, Sonoma, and Mendocino, is one of the region’s most popular and widely recognized travel guides. Digital e-Book formats for iPad and Kindle are also available. For more information visit www.Californiafinewineries.com or call Wine House Press at 707-996-1741. Azul Tequila: Monday through Friday 3pm until 7pm, $3.75 House Margaritas, $3.50 wine by the glass, $3.50 well drinks, $.99 Coors light draft, (All other draft beers $3.50) and $5 appetizers. Bier Academy, Beer Bar and Grill: From 3 p.m. to 6 p.m. $1 off pints and appetizers. Pints can range from $3.50 to $7 depending on the type of beer. Always have 16 ounce $3 Rolling Rocks or PBR. BJ’s Brewhouse: Monday through Friday 3-7pm, Sunday through Thursday 10pm until closing and all day Tuesday is half off wines by the glass or bottle. 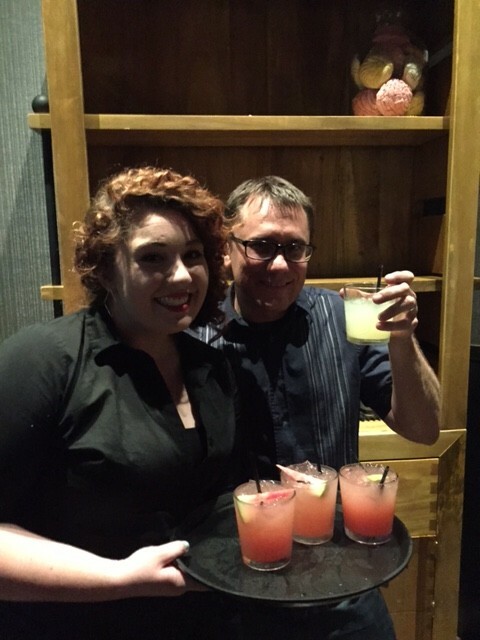 $4 craft beers and call drinks, $5 Mojitos and Martinis, $6 select wines by the glass, Happy Hour food menu. Black Angus Steakhouse: Monday through Friday from 3pm until 7pm in the bar, Tuesdays and Sundays all day long, $3.50 well drinks, $4.50 16 ounce bottled and draft beers, $5.50 select wines by the glass and reduced prices on full sized appetizers. Claim Jumper Valencia: Monday through Friday from 3pm until 6:30pm, Saturday 11am until 3pm, in the saloon only. Select menu of items priced between $2 and $8, $4 pints of draft beer, $5 to $8 select cocktails and $5 select wines by the glass. Sazerac with Whistle Pig, Antigua Bitters, nice and neat at Cuvee. Don Cuco Newhall: Daily from 4pm until 7pm, select beers between $3.00 and 4.50, $5.95 Margaritas and $5.25 well drinks, half price on all appetizers, in the bar only. Gyi-Kaku Sushi Bar: After 8:30 p.m. you can get house sake for $2.95, a mug of Sapporo for $3, a pitcher for $6.50, 50% off all cocktails. Kabuki: Monday through Friday 3pm until 6pm, Monday through Thursdays 9pm until closing and 8 pm until closing on Sundays. Select cocktails $5.95 to $6.50, lowered prices on select hot and cold Sakes, select wines are $3.50 a glass and lowered prices on select beers. Lazy Dog: Monday through Friday 3pm until 6pm, Sunday through Thursday 9pm until closing in the bar and patio only, drinks priced from $3 to $7 and Happy Hour portioned appetizers between $3 and $6. Le Chene: 4:30pm until 7pm every day except Saturday. No specifics on website. Lucille’s Smokehouse Bar-B-Que: In the bar only from 3 until 7 pm Monday through Friday and 9pm until closing every day. Happy Hour menu, select 22 ounce draft beers between $4 and $5, $5.50 – $7.50 select wines by the glass, $4.25 well drinks, $6.50 – $7.25 Martinis, featured cocktails between $4.75 and $7.50. Margaritas Mexican Grill: Monday through Friday from 3pm-7pm in bar area only. No drink specials listed on website. Marston’s Valencia: Tuesday through Sunday 5pm to 7pm. $1 off Marston’s specialty drinks and Martinis, $4 select glasses of wine, $4 all draft beer, $3.25 bottled beer, $5 well drinks, $6 well martinis and Cosmopolitans. Happy Hour Appetizer menu. Newhall Refinery: Available Tuesday – Friday 3:00pm-5:00pm: House Wine – Cabernet or Chardonnay $4, Specialty Beer Flight – Bartender’s Choice (3) 4oz. Draught $4, Custom Beer Flight – your choice of (3) 4oz. Draught $6, Brown Bag Special – 12oz. Bottle, Bartender’s Choice $4 (Guess brown bag style beer for additional comp), Wine Flights – your choice of (3) 2oz wine by the glass from $6, $2 off small bottled beer, $4 off large bottled beer, $2 off wine flights, $2 off wine by the glass, HAPPY HOUR BITES Available Tuesday – Sunday 4:00pm-5:00pm – Chipotle wings, lime cream, peanuts & cilantro $6, Chicharones, house yuzu kosho hot sauce, celery greens, radish $4, Pickled beets and cherries, frisee, warm goat crostini $5, Mini refiners fries $5, Warm olives $3 and Chili lime bar nuts $3. New Moon Valencia: In the bar and lounge weekdays from 5pm until closing and all day long on weekends. Cocktails from $5 to $6, beer $3.75 to $5.50, wine $5 and appetizers from $3 to $6 (most are $4). The Oaks Grille (inside TPC, Tournament Players Club): 4:30-6:30 Wednesdays and Thursday. Persia Restaurant and Persia Lounge: Monday to Thursday 3pm to 7pm house wine $3.50 Domestic Beer $3, and Reverse Happy Hours every night from 8pm until closing for the same prices. Presidente Santa Clarita: Monday through Friday from 2:30pm until 6pm in the cantina only, small bites starting at $2.50, all draft beer $3.25 for 14 ounce and $5.50 for 22 ounce, $4 plain and $4.50 flavored16 ounce house Margaritas, $5 to $6.75 for 16 ounce premium Margaritas, $3.50 to $4.25 tequilas, $3 well drinks, $4 house wine by the glass. Rattler’s Bar B Que: Monday to Friday 3-7 p.m. bar only, food priced between $1.50 and $5.50, 16 oz. draft beer $4.99, 20 oz. draft beer $5.99, specialty cocktails $7 to $9. Route 66 Classic Grill: Happy Hour in the bar and patio only and not during special events, Monday through Friday 3pm until 6pm and again from 9pm until closing, Saturday 9pm until closing and Sunday 7pm until closing. $1 off draft beer and $1 off well drinks. Sabor Cocina Mexicana: Monday to Friday 2pm until 6pm $6 margaritas, $4 beer, $4 well drinks and $6 appetizers. Salt Creek Grille Valencia: Monday through Friday 4-6:30 pm in the bar only, well drinks $4, draft and bottled beers $4 and house wines by the glass $4. Bites ranging from $4 (soup of the day) to $10 (jumbo shrimp cocktail). Sisley Italian Kitchen Valencia: Monday through Friday 3-7pm, Saturday 8-10pm and all day Sunday well drinks between $3 and $5, several appetizers between $3 and $4.95. NEW 2015: Solita Tacos and Margaritas: Two Wood Grilled Chicken, Crispy Fish and Tofu tacos for $4.00, Oak-Roasted Chicken, Pork Carnitas, Chorizo Sweet Potato and Black Bean or the Chicken Taquitos are $5. Guacamole $6. House, Frozen or Skinny Margarita for $6. Well drinks and wines $5.00. (solita Tacos & Margaritas Valencia will be rolling out more specials every Tuesday, for Taco & Tequila Tuesday, offering live music, Frozen Margarita Flights, taco options and more from 3:00 pm to close.) Happy Hour and Reverse Happy Hour every Sunday, Monday, Wednesday, Thursday and Friday from 3:00 pm to 6:15 pm and 9:00 pm to 11:00 pm; Taco Tuesday is every Tuesday from 3:00 pm to 10:00 pm, with the bar staying open until 12:00 Midnight. TGI Fridays: “Drink specials all day, every day” includes $3 – $4 beers, cocktails $4 and up. Vines (in the Hyatt on Town Center Drive): Lounge and patio from 4pm until 7pm daily, $6 bites, $5 bartender specials as well as select wines, $4 domestic beer and $5 craft beer. The Vu: Everyday 4 to 8pm. Wokcano Valencia: In the bar and lounge area: Monday 11am until 2am, Tuesday – Thursday 3pm to 7pm and 9pm to 2am, Friday 3pm until 7pm, Saturday 11am to 5pm, Sunday 11am to 5pm and 9pm to 2am. Happy Hour food menu, $4 draft beer, $4 Sangria, $4 well drinks, $4 house wine, $5 Sake Bomb. Wolf Creek Restaurant: In the bar area only Monday 4pm until closing, Tuesday through Friday 4pm until 6:30pm, Saturday 8pm until closing. Happy Hour pizzas $5.50 and 25% off other appetizers. Wood Ranch BBQ & Grill: Happy Hour 3pm until 6pm. MAGNOLIA HOUSE: No need to knock, as the door is always open at Magnolia House! Pasadena’s favorite new restaurant and bar introduces Neighborhood Hour every Monday through Friday from 4:00 pm to 6:30 pm. Offering discounted wines, well drinks and their signature cocktails, this cozy bungalow has something for everyone on the block. Sip on Bar Manager Colin Shearn’s tasty Cocktail of the Moment from his newly released cocktail menu for only $7.00, or kick back and relax while you enjoy the signature Magnolia House Sangria for $6.00. Pint-loving pedestrians will not be able to resist popping in to try all five craft beer options (at just $5.00 each), including the Craftsman 1903, Heavenly Hefe, Mother Earth Cali’ Creamin’, Santa Barbara Common Ale and Swamis IPA. Pair these budget-friendly beverages with gourmet snacks from Executive Chef Kyu Yi and bite into delicious dishes like Crunchy Ahi Tacos with spicy tuna, avocado crema and radish or Margherita Flatbread ($8.00) topped with spicy tomato, burrata, basil and a cilantro-pistachio pesto. Or get food tipsy off the Drunken Nachos ($7.00) smothered in beer queso sauce. Additionally, guests can dine on Blistered Shishitos ($5.00) served with sweet Thai chili and ponzu sauce, as well as Lebanese Beef Skewers,($6.00) drizzled with tahini yogurt sauce. Do not miss out on this new hotspot, where Neighborhood Houris reinventing Pasadena evenings and making it easy for you (and your wallet)! Magnolia House is open for Neighborhood Hour Monday through Friday from 4:30 pm to 6:00 pm; 492 South Lake Avenue, Pasadena, CA 91101; 626.584.1126. RASCAL: The only rule at Rascal, is that there are no rules! 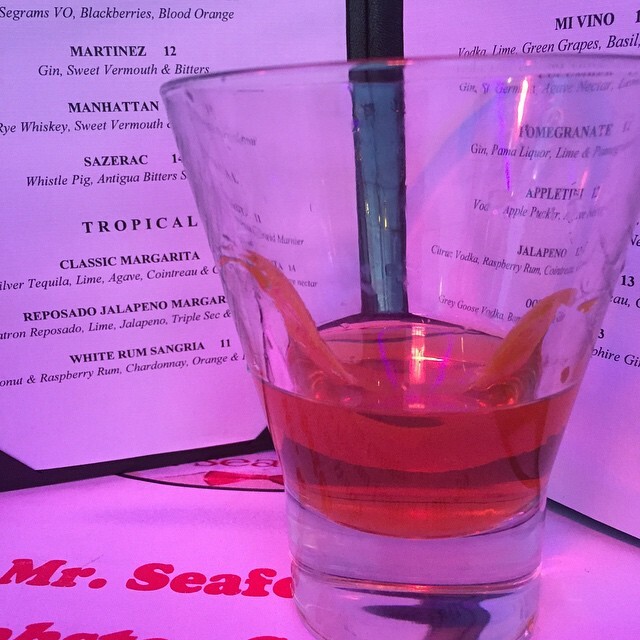 This favorite local hotspot on South La Brea Avenue hosts Happy Hour seven days a week. With $6.00 Eats & House Libations available throughout the entire restaurant (not just bar), it is quickly becoming everyone’s favorite pastime. With something for everyone, Rascaloffers traditional beverage choices including cocktails like the Moscow Mule and Margarita, as well as House-Made Red Sangria and the Cold Duck, a sangria topped off with sparkling cava brut. Beer lovers can enjoy pints of the North Cost Scrimshaw Pilsner, while discriminating winos will delight in select red, white and sparkling wines like the 2013 Solar de Estraunza and the 2011 Garnacha Beso de Vino. Executive Chef Andy Lee keeps everyone happy with favorites like Spicy Italian Sausage with blistered red watercress, olive oil and olive tapenade, a classic Burger topped with beer-deglazed caramelized onions, cheddar, arugula, vine-ripened tomato and herb remoulade, as well as Brussels Sprouts sprinkled with smoked bacon, shallots and garlic and drizzled with whole grain mustard sauce. Buttermilk marinated fried chickenis so good, it is served two ways: A Fried Chicken Sandwich, which is stacked with tomato, Napa cabbage and tzatziki and the classic comfort-dish, Fried Chicken & Gravy is smothered with Italian sausage gravy. Non meat-eaters can enjoy a pita bread-packed Vegetable Gyro Sandwich stuffed with potato croquet, tabbouleh, curry hummus, tzatziki and queso fresco. Why let the happy stop there? Rascal wonders the same thing, which is why every Sunday is Sunday Funday, a game night, offering a variety of board games for patrons to play, while sipping on Happy Hour cocktails (at Happy Hour prices) “all night long.” Checkmate! Rascal is open for Happy Hour from 5:00 pm to 7:00 pm every Tuesday through Saturday, and 5:00 pm to 11:00 pm every Monday; and Sunday Funday is every Sunday from 5:00 pm to 10:00 pm; 801 South La Brea Avenue, Los Angeles, CA 90036; 323.933.3229. TIPPLE & BRINE: Known for their bountiful bivalve bar of fresh oysters and creative custom cocktails, Tipple & Brine continues to shine and is quickly becoming the gem (or pearl, more appropriately) of Sherman Oaks. Currently presenting a Social Hour every Monday through Friday, from 4:30 pm to 6:30 pm, guests can stop in for gourmet fare and drinks at discounted pricing. Dive in with $5.00 Oyster Shooters and $7.00 house-made classic cocktails, like the Old Fashioned or Moscow Mule crafted with Tito’s Vodka.The beer and wine is more than fine, with $5.00 draft offerings of Firestone IPA, Mama’s Little Yella Pils, Golden Road Hefe, Craftsman 1903 or Dogtown Brown and four wine selections of Pinot Grigio, Chardonnay, Pinot Noir or Cabernet Sauvignon for just $6.00 per glass. Slurp down fresh Oysters for just $2.00 a piece or a plate of Warm Marinated Olives for only $4.00. Additional menu favorites are occasionally rotated during Social Hour, but generally consist of delectable dishes like Crispy Oysters with sauce gribiche ($7.00), Brussels Sprouts ($5.00) and Mussels & Fries ($7.00). 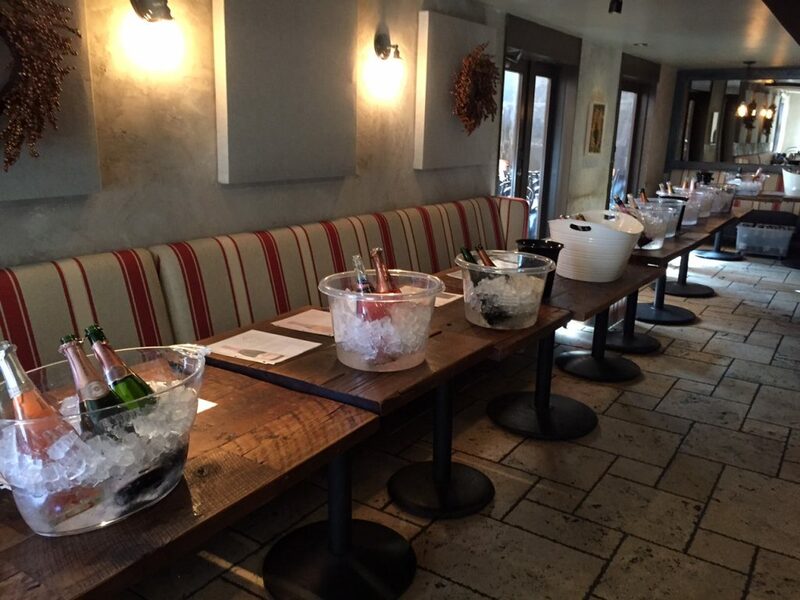 Stop in for some social time and savor some of these select pairings at this Sherman Oaks hotspot! Tipple & Brine is open for Social Hour every Monday through Friday from 4:30 pm to 6:30 pm; 14633 Ventura Boulevard, Sherman Oaks, CA 91403; 818.528.2550. Most of us will be running around looking for that perfect Christmas gift for our loved ones right up to the last minute. But let us not forget to purchase the wines that will pair with the food we will all be enjoying over the holidays. There are some basic pairing rules to help you with this process. The first rule is not to look at how cool the label looks. You are not drinking the label. But the label will tell you what is in the bottle and the year the grape was harvested… the vintage. Some wines are supposed to be opened and enjoyed while young. Other wines should be kept and stored for a while and then enjoyed. The second rule of buying wine is to know what food you will pair with the wine. Below, I will offer my guide for you to know what variety of wine to pair with what type of food. Typically, at Christmas time, roast beef, lamb, turkey, ham, and roasted vegetables are on the table. So here is the list categorized by food type. Serving roast beef? Choose Carmenere, a medium bodied wine from Chile or a more full-bodied Syrah from either Washington State or Paso Robles, CA. Of course Cabernet Sauvignon from Napa, CA will always be a perfect match. Serving roast lamb? Choose a nice Merlot from Bordeaux, France, but make sure it’s either a 2005, 2007, or 2009. If you can’t find this vintage, look for a Barbera (Italy). You can always pick up a Primitivo, which is the Italian cousin to the Zinfandel. Serving ham? Choose a Chateauneuf du Pape (France), Amarone (Italy), or a lighter Pinot Noir from Oregon. Of course white wines such as Chenin Blanc from California or France pair nicely. Sauvignon Blanc’s from Marlborough, New Zealand are particularly delightful as well. Serving roasted vegetables, especially root vegetables? You must rely on the fact that roasting vegetables will have more of a robust flavor on the palate. It would be wise to choose a more medium bodied wine such as Chardonnay (oaked) from California or a Rosé. If you are not into white wines or Rosé, try a Lambrusco. This is a slightly sweeter wine from Italy, but will hold up to the sweetness on some of the vegetables served with the meal as well. Let’s not forget Champagne during the holidays. Don’t wait until New Years Eve to open a couple of bottles of bubbly. Let’s face it; buying Champagne is not always easy. Champagne can only be called “Champagne” if it is made in Champagne, France. But, there are sparkling wines that are made in the same fashion as its counterparts in Champagne, France. If you like that fresh baked bread, yeasty, aromas and flavors found in Champagne then you can expect to pay upwards of $60 for a good bottle of the bubbly stuff. Talk to your wine merchant and let them know you are looking for elegant, not opulent Champagne. Remember, a vintage Champagne will cost a lot more than the non-vintage (NV). Here are some sparkling wines from other countries — Cava, a sparkling wine from Spain. Cava’s are dry and fruity with not a lot of the yeastiness on the nose or palate. Crémants are sparkling wines from outside of the Champagne region. A crémant rosé from the area of Alsace, France are by law to have 100% Pinot Noir grapes. Metodo Classico is from the northern part of Italy. These wines still have that fresh baked bread aroma and some nuttiness on the palate. Look for ones from the Franciacorta DOC and Trento DOC. There is only one rule when pairing wine with desserts… the desserts cannot be sweeter than the wine or it will make the wine taste bitter. Look for fortified wines such as Sherry, Ports or a Pedro Ximinéz (PX). 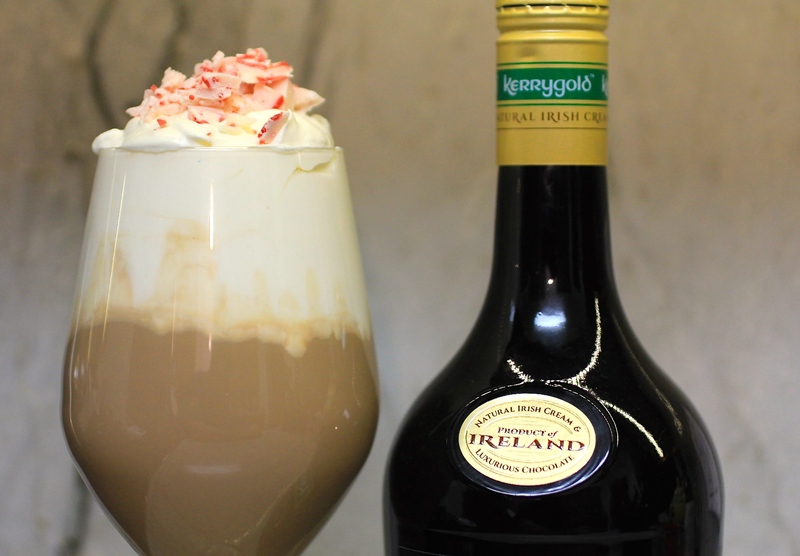 Better yet, purchase a bottle of Kerrygold Irish Cream and make your own dessert drink with this beautiful blend of Irish cream, Irish whiskey and chocolate. Scott Richardson has been in the hotel and restaurant business for almost 30 years. His love for producing remarkable food and service evolved to his love for all things wine. Scott has worked at many prestigious locations including The Cavendish Hotel, in London England and The Grove Park Inn and Resorts in Asheville, NC, as well as Walt Disney World and Universal Orlando Resorts as General Manger of several restaurants. His culinary background and his love for wine pushed into the teaching profession with University of Central Florida’s Rosen School of Hospitality Management, Valencia College, Johnson and Wales University and New England Culinary Institute, where he wrote Advanced Food and Wine Pairing, currently being offered as part of the school’s BS in Food and Beverage Management degree. If that was not enough, Scott is also a volunteer judge at several food and wine festivals in Central Florida throughout the year. In his spare time, Scott writes for The Park Press, his column “The Educated Palate” can be found at www.theparkpress.com. Scott is currently pursuing his passion in wine by working towards his PhD in Hospitality Leadership with research in the wine tourism industry. Scott can be reached at scott@theparkpress.com or you can follow him on Twitter @1educatedpalate.